This article is about the powerup in Super Mario World that turns Mario into Balloon Mario. For the powerup in Super Mario 64 DS that also turns Mario into Balloon Mario, see Power Flower (Super Mario 64 DS). 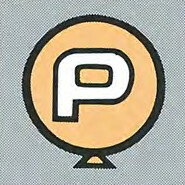 A round, yellow balloon with a "P" on it. Turns Mario into Balloon Mario. The Power Balloon, sometimes shortened to P Balloon, is an item introduced in Super Mario World. It can be found in four levels: Donut Secret 1, Donut Secret 2, Forest of Illusion 1, and Tubular. The item's effect is to make whoever picks it up swell up like a balloon and become Balloon Mario or Balloon Luigi, causing them to hover in the air. They will gradually float upwards if not moved by the player, but are capable of moving in any direction for a limited amount of time. During this time, Yoshi cannot be ridden. Mario or Luigi will start to puff in and out when the item is about to wear off, and when it does they return to normal size and drop out of the air. The level Tubular in the Special Zone requires the player to continually pick up new Power Balloons to maintain flight while they make their way across the level. If Mario or Luigi pass through a Giant Gate while under the effects of the Power Balloon, they will gain a bonus Super Mushroom. The Power Balloon also appears in volume 6 page 111 of Super Mario-Kun, being featured in a single chapter. It shows itself coming out of a ? Block. The Power Balloon made three appearances in the Super Mario World television series, most notably in the episode "Mama Luigi" where Luigi uses it to float safely down a chasm. Later in the episode, Mario uses it to re-inflate Luigi back to his normal shape after he was flattened. In the series, the Power Balloon is referred to as a magic balloon. It also appears in another episode, "Gopher Bash". If Mario or Luigi has the powers of a Super Mushroom, Fire Flower or Cape Feather, and grabs a Power Balloon, he will still have whatever powers he originally had as well as those of the Power Balloon. However, if he collects any of these items while under the effects of a Power Balloon, the Power Balloon's power will instantly wear off. 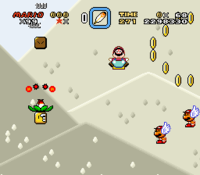 In Super Mario World: Super Mario Advance 2, when Mario or Luigi grabs a Power Balloon, the music becomes slightly slower than usual. Slow music also plays in Super Mario 64 DS while Mario is under the effects of the Power Flower. ↑ Nintendo Mario Mania Player's Guide. Pages 73, 74, 107 & 160.